The D-Link DIR-825ACG1 router has a very basic firewall that helps protect your home network from unwanted Internet access. The firewall works by blocking all connections to your local network unless it has been authorized by your router. 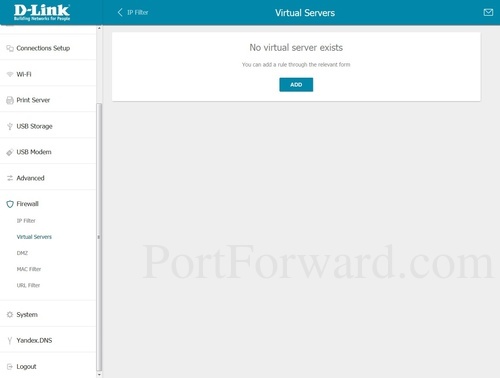 In order to authorize additional connections for an online game or program to run smoother you need to create a port forward. 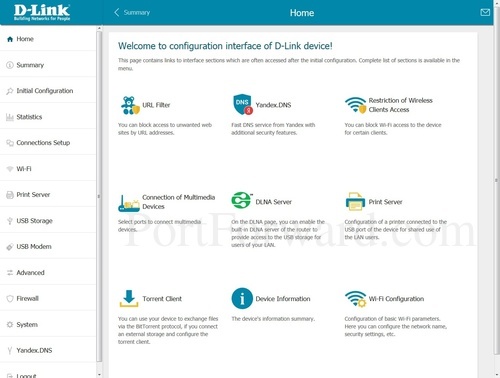 How to login to the D-Link DIR-825ACG1 router web interface. How to find the port forwarding page in the router's web interface. How to setup a port forward for the online game or program of your choice. TIP: Write this static IP address down. You need it in Step 4. You need to open up the router interface. To do this you need to use a web browser because this router uses a web interface. It normally doesn't matter which browser you decide to use, simply pick your favorite such as Edge, Internet Explorer, Firefox, or Chrome. In the above image we have circled the address bar for you. To get to the router login page you need to enter the router's IP address in the address bar. The router's IP address is also called the computer's default gateway. If you don't get a login screen then it is possible the router's IP address was incorrect. Find out what the current IP address is by following the instructions on our How To Find Your Router's IP Address. Go ahead and enter the router login username and password and press the Login button. First, check all the different D-Link default combinations. Here is our list of all known Default D-Link Router Passwords. Second, try and guess what the password/username was changed to. Use our Find Password App to make this step easier. Finally, if you are still stuck after trying both of the above options, it may be time to consider a factory reset. Learn more about this option on the How to Reset a Router page. Begin by clicking the option of Firewall in the left sidebar. Then select Virtual Servers under that. You now are on a page like the one above. Click the blue Add button to create a new port forward. Enter the name of the program into the Name box. It doesn't really matter what you put into this box, but something that will remind you why these ports are being forwarded is be a good idea. Use the Template dropdown box to choose Custom. From the Interface dropdown box pick <All>. 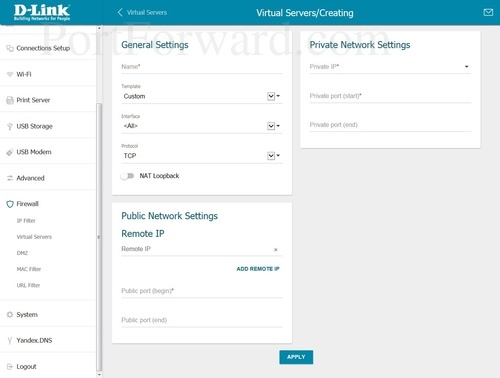 If you are forwarding a range of ports, enter the lowest number of the range into the Private port (start) and Public port (begin) boxes. Then enter the highest number of the range into the Private port (end) and Public port (end) boxes. 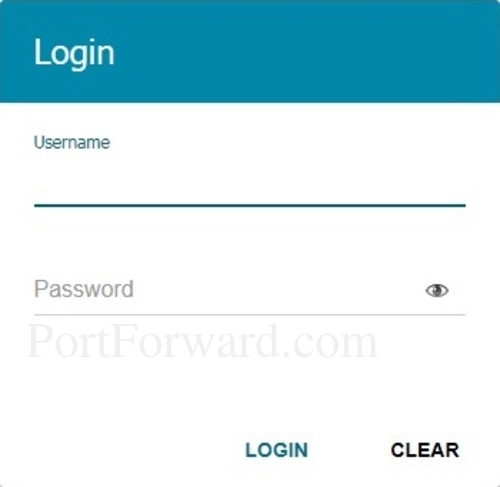 If you are forwarding a single port, enter that port number into the Private port (start), Private port (end), Public port (begin) and Public port (end) boxes. Leave the Remote IP box blank. Are the ports you just forwarded really open? An easy way to find out is use our free Open Port Checker. It uses a local application to see if the ports are open or not. This guarantees our port checkers accuracy. Check out our other guides. We have a growing list of free gaming, networking, and software guides here at portforward.com. Our other site setuprouter.com can help you setup a secure home network with your exact router.